Khrungthep has no shortages of new cinemas: every mall has one and all of them feature digital sound, stadium seating, and all of the amenities you would expect from any megaplex cinema in the United States. In fact, there is a shortage of grand old cinemas here even though the city used to be full of them. These days there are just three cinemas, all owned by the Tansacha family as part of the Apex Cinemas, that are holdovers from the days before multiplexes. 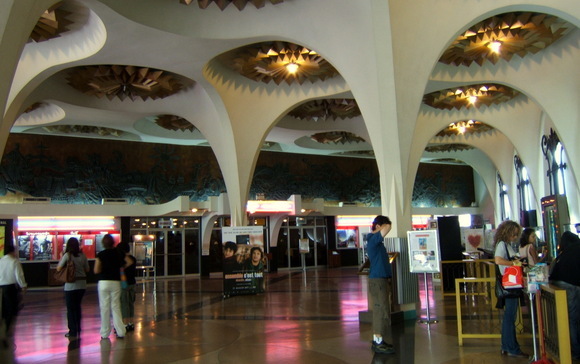 Of those, the Siam and the Scala are the two “grand” cinemas whereas the Lido is a series of three smaller auditoriums. The Scala opened in 1967 in Siam Square. 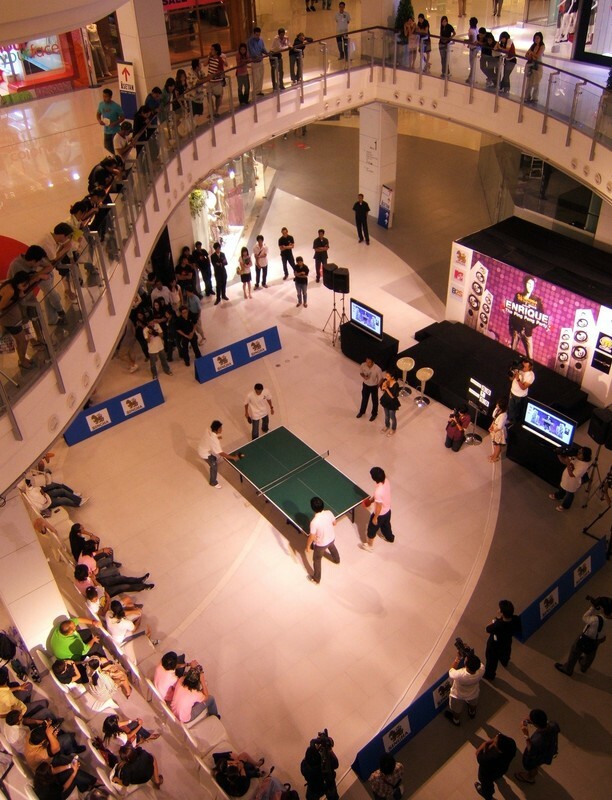 In those days, Siam Square was the only shopping center in Khrungthep, and today it is still the hub of shopping in the city, around which has sprung up an impressive (and seemingly endless) number of malls including MBK, Siam Discovery, Siam Center, and Paragon. The 900-seat Scala has one of the most beautiful lobbies: it is done in a Moorish style, featuring twin grand staircases, a large chandelier, and a sculptural relief along one of the ways. It also features a hand-painted movie poster – one of the last in the Kingdom. It is changed every few weeks to advertise whatever big picture is coming out soon. Best of all, the Scala along with its Apex Cinema siblings show a combination of foreign and art films. This weekend, Todd and I went to see Paris j’taime and well as Woody Allen’s Scoop. 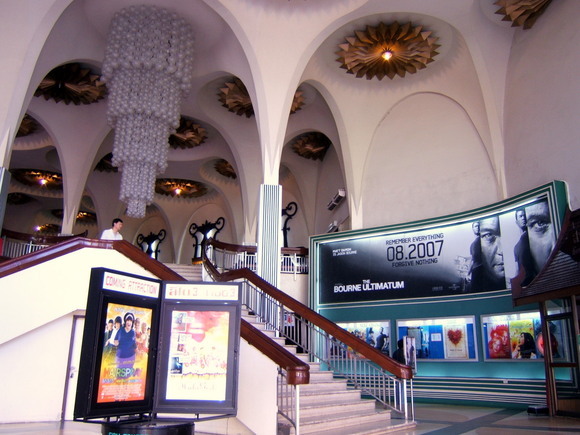 Not only does the Scala offer one of the largest cinemas, but the tickets are cheaper than at the malls (100 baht versus 120 to 160) and good seats are available even at showtime. 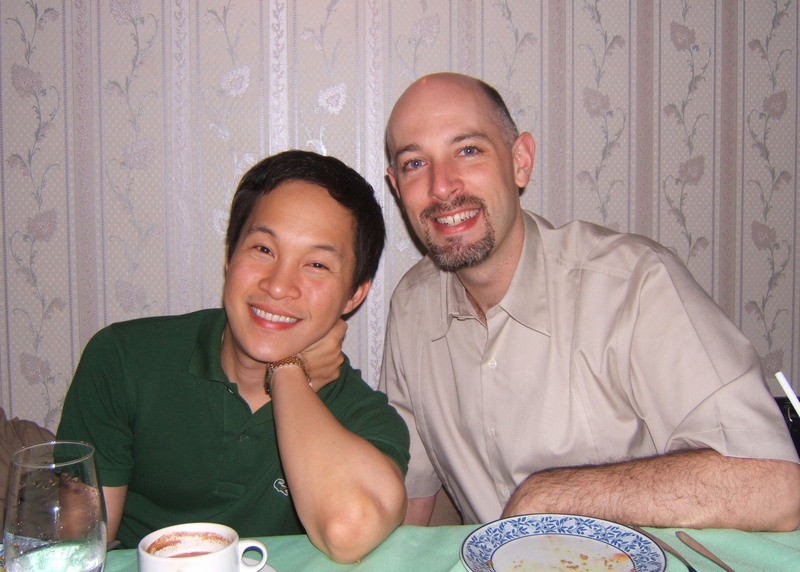 Tawn returned home from his company trip to Beijing on Monday evening. The flight was supposed to arrive about 9:35 but Tawn SMS’d from Beijing saying they were sitting on the tarmac and would probably arrive about 10:15. Checking the THAI Airways site before leaving home, they were showing an on-time arrival which I knew wasn’t possible. Sure enough, the flight was delayed. Initially it was showing a 12:15 am arrival and eventually that was pushed to 12:50. Normally I’d be thrilled to spend three hours at the airport but Suvarnabhumi at night isn’t very interesting. To top it off, the two observation areas have been closed ostensibly for remodel. 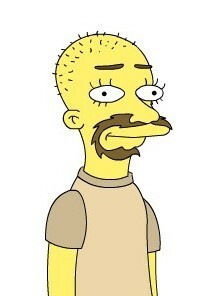 This morning when Tawn took a look at my Simpsons entry, he was amused and said his avatar is a striking similarity to him, but that the stubble-headed me doesn’t quite capture my essence. We went back in and he selected the completely bald head. Comparative thoughts? New one is on the right. Well, I wanted to resist the marketing and not write anything about The Simpsons Movie. 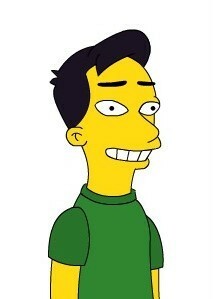 But then Sheldon posted a picture of his Simpsons avatar and being a Simpsons fan, I thought it would be funny to see what Tawn and I would look like as Simpsons characters. Sorry, I couldn’t resist. Oh, the film festival is almost over. Thank goodness. As much as I enjoy watching films, the films I’ve watched have been about 40% “ho-hum”, 30% “okay” and 30% “oh, that was pleasant”. It is hard to say if it is just the selection of films I saw or a reflection of the festival’s programming. One film that really caught my attention was Nia Dinata’s Love for Share. 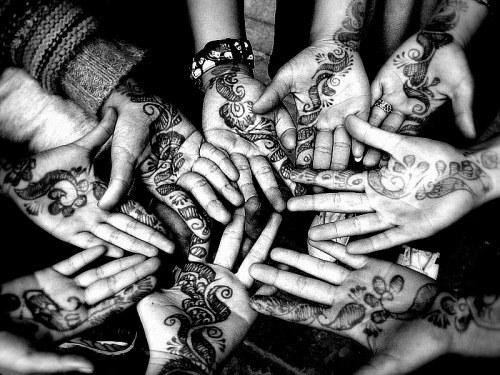 About polygamy in Indonesia, the three loosely interconnected stories tell of three women from three different backgrounds and places in life. Yet all three are tied together by the common experience of being one of their husbands’ multiple wives. The first story is about a doctor who must reconcile her devotion to her religion and her only son with her discontent at her husband’s many surprises. The second story takes place in an over-crowded slum as the new third wife chafes at her situation and forms a tight bond with the second wife. The final story is of a self-involved young waitress who vows to make her status as a second wife work to her advantage. While Dinata stakes out an anti-polygamy perspective, the film is surprising in that it doesn’t come to quite so clear-cut an opinion, reflecting the complexities and intricacies of feelings, circumstances, and relationships. One more day and three more films to go. This evening I stopped by the opening night event for Justin’s photo exhibition at Tamarind Cafe. His photos are really nice and he had done a couple of blow-ups (2 meters wide) highlighting two of his most stunning pictures. They look really good in the restaurant. It was nice to visit with him and also with Roka and Ryan, who were there to lend their support. 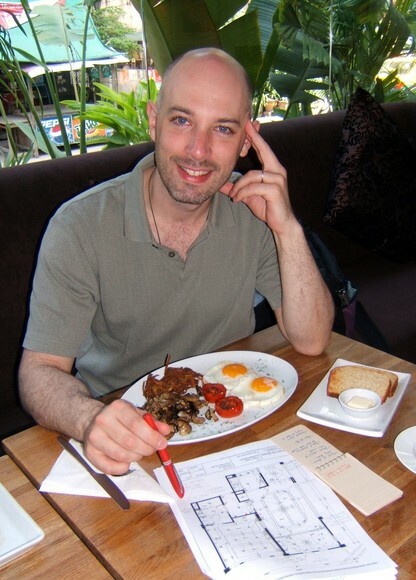 Justin Brooks, British expat, English teacher and talented photographer, will have his works displayed at Gallery F-Stop (located at Tamarind Cafe, the tasty vegetarian east-west fusion restaurant on Sukhumvit Soi 20) beginning this Friday, 27 July. In fact, there is an open invitation to the opening night party, starting at 6:00 pm. Justin does a lot of work in black and white, creating beautiful textures and using a strong hand in controlling light exposure to create luminous photos. These are two of his photos as a sample and hope those of you in Khrungthep will take the opportunity to see them all at Tamarind Cafe. 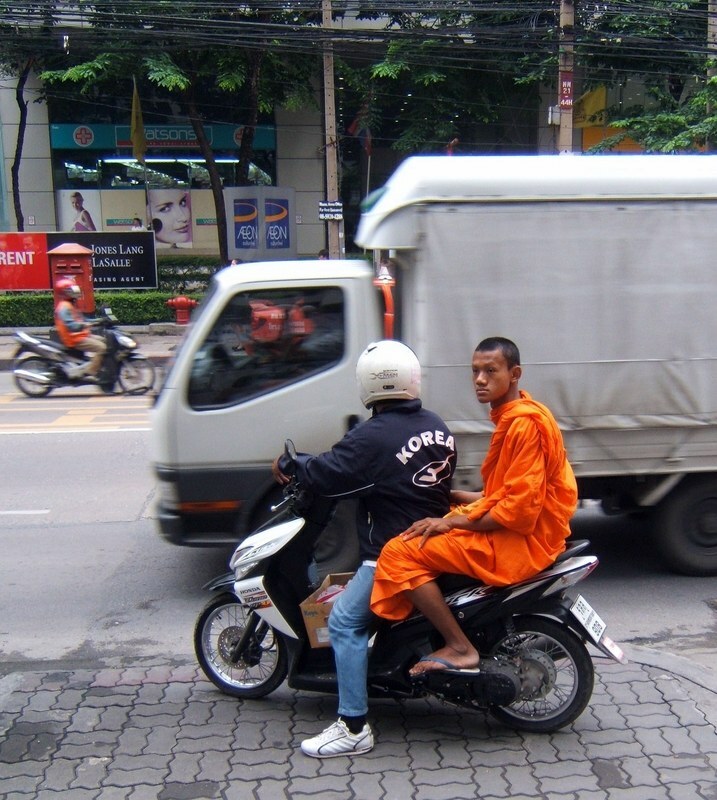 Here is two interesting photos I took, one on the way to class on Monday of a monk riding on the back of a motorbike, the other of a celebrity ping pong tournement between two sets of radio station DJs at Central World Plaza mall on Tuesday evening. 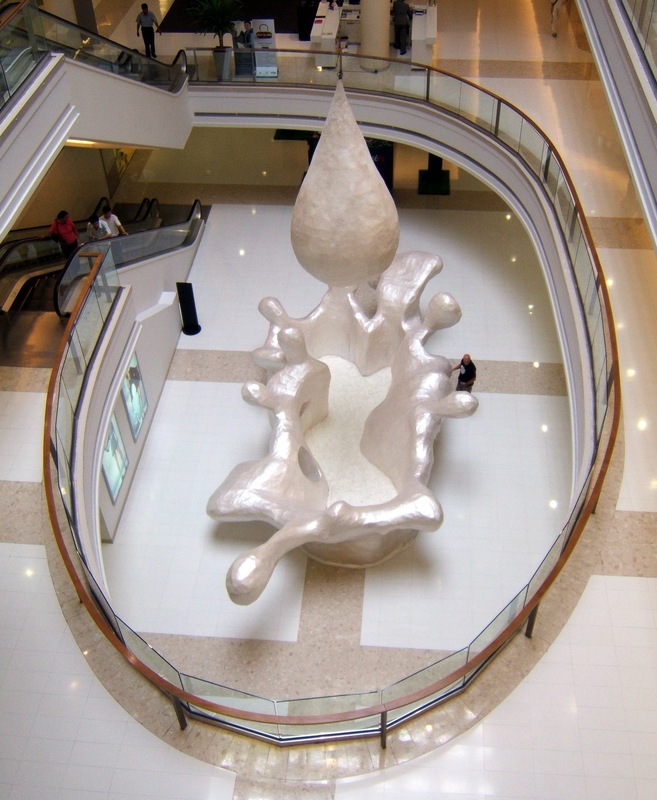 On display at the surprisingly (or not) empty high-end Gaysorn mall, affectionately called Gay Zone by the local Silom crowd. A sign I spotted at a nearby construction site this evening which blocked the sidewalk. I think it really does say what the meant to say. After attending the homeowner association meeting (see below) we went upstairs to take a look at the progress on the remodel. As expected, there wasn’t a whole lot accomplished this week. 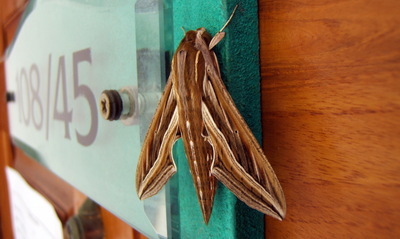 Right: An interesting moth on our front door. An auspicious sign? Below: The widening of the living room wall had been completed, making the entire wall flush with the structural beam along the ceiling. The electrical outlet and the door frame going into the master bedroom still have to be pulled forward, but that will be easily accomplished later on. 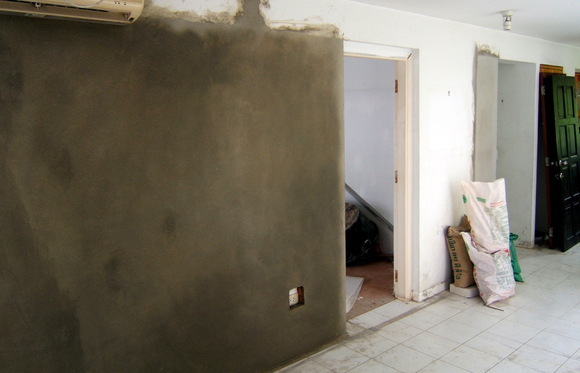 Additionally, the wall extension between the main entry hall and the living room has been completed, creating more of a visual separation between the two spaces. Good news on the bathroom doors which, you may recall, were incorrectly installed when we visited last week. Both have been pulled out and the correct doors have been put in, instead. Also, the door leading into the master bedroom from the bath has been moved to the left as it was supposed to be. 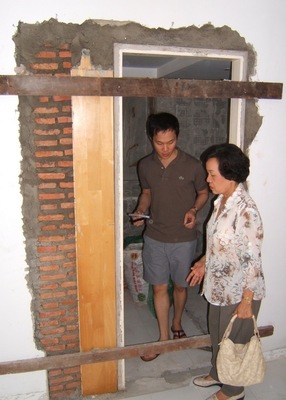 Below left: Last week Tawn and his mother inspected the door that was taken out and then put back in in the exact same place, not moved to the left as per the blueprints. 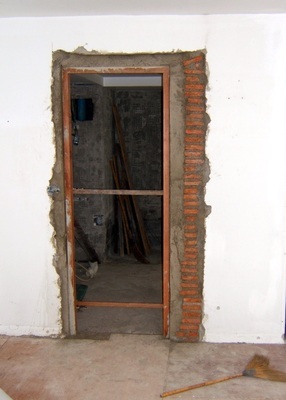 Below right: This week we see that the door was taken out, replaced with the new wood door frame, and was moved to the left about 20 cm (8 inches). The hardwood floors (we chose ash) are on order and should be installed this coming week. There is a question over which pattern to use: our designer, Ble, wants us to use a herringbone pattern but I’m inclined towards a standard brick pattern. Left: Sunday morning we had breakfast at Tamarind Cafe, the vegetarian restaurant on Sukhumvit Soi 20, and went through the draft architectural plans in details to come up with a list of questions and concerns for Ble. 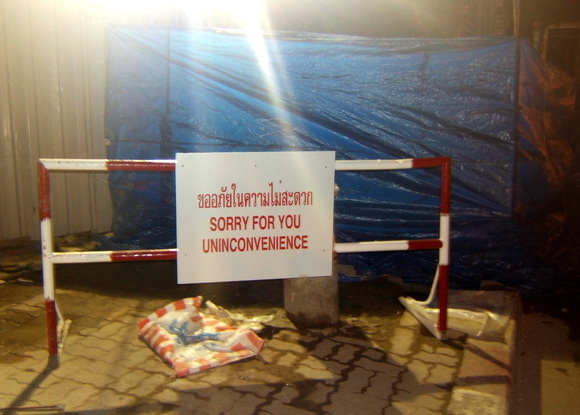 Afterwards, we went to his shop on Sukhumvit 23 and spent almost two hours pouring through the plans. At this point, he has enough information to draw up “final” plans and send them to the contractor for a price estimate. Yes, this may seem a little strange to only be getting to final plans now, considering that we’ve gutted the house already. But that’s the way it is done here, or so I’m told. And the areas gutted are all changes we know we are going to make one way or another. You’ll notice in some pictures that the kitchen has not been gutted. That’s because we’re not certain if we can afford to do the kitchen remodel at this time. The remodel itself wouldn’t be too bad, but the remodel plus new appliances could be very pricey. 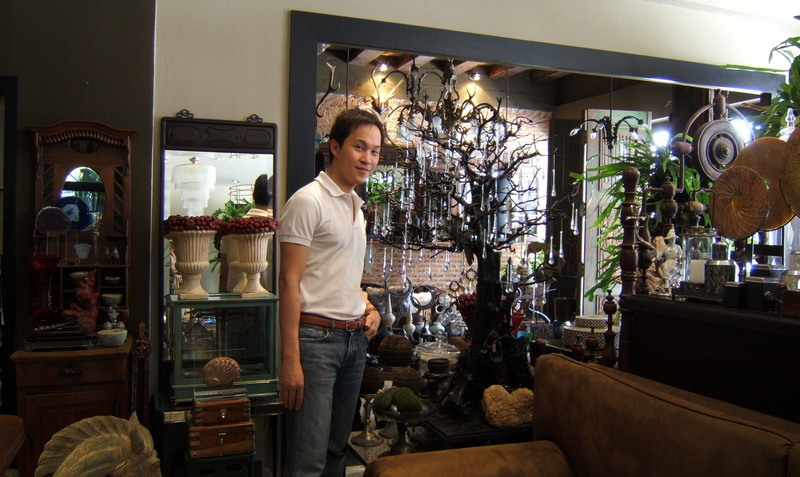 Below: Tawn at Ble’s shop, filled with things that he would love to have in the house.